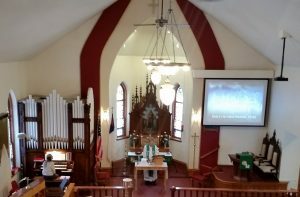 First Lutheran Church – “Putting Christ First.” First Evangelical Lutheran Church of Pecatonica is a member congregation of the Evangelical Lutheran Church in America (ELCA) and the Northern Illinois Synod. Our congregation serves people in the towns of Pecatonica and Winnebago, Westlake Village, and other nearby communities. Surrounded by the beauty of God’s creation and the bounty of the fields, we are blessed with a quality of life that is sought by many people today. Our congregation is known for its family atmosphere, its friendly and welcoming nature and for offering a unique blend of traditional and contemporary aspects of worship and ministry. The traditions of Lutheran worship and ministry continue to provide the foundation for First Lutheran. We offer traditional worship each week; Holy Communion is offered at every worship service of the congregation; We walk together in Christ-centered relationship, striving to serve others as Christ’s Body in our world today.